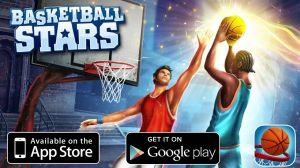 Available on Android and iOS this free-to-play online basketball game which consists of one on one Gameplay, offline practice, and one Mini-Game. The game begins with you creating your player and as the game progresses you modify their attributes with the in-game Currency you earn. If you want to change how your character looks immediately there is always the option of spending real money. Character attributes you can change include skin colour, hair, clothes, acessories and basketballs. The graphics, sound effects, and in-game music are great and help make this one of the better games currently on the market.